Ability of an organism to take different shapes is polymorphism in bio world. A simplest definition in computer terms would be, handling different data types using the same interface. In this tutorial, we will learn about what is polymorphism in computer science and how polymorphism can be used in Java. Polymorphism in computer science was introduced in 1967 by Christopher Strachey. Please let me know with reference if it is not a fact and the tutorial can be updated. Following are the two major types of polymorphism as defined by Strachey. If we want to say the above paragraph in two words, they are operator overloading and function overloading. Determining the operation of a function based on the arguments passed. In Java we have function overloading and we do not have operator overloading. Yes we have “+” operator implemented in a polymorphic way. The definition is when the type is different, the internal function adjusts itself accordingly. int and float are different types and so even the following can be included in polymorphism operator overloading. Similarly even * and / can be considered as overloaded for int and float types. Having said all the above, these are all language implemented features. Developers cannot custom overload an operator. So answer for the question, “does Java supports operator overloading?” is “yes and no”. Java wholeheartedly supports function overloading. We can have same function name with different argument type list. For function overloading in Java I have already written a super-hit tutorial and I am sure you will enjoy reading it. In inheritance, the ability to replace an inherited method in the subclass by providing a different implementation is overriding. Function overriding in is discussed in the same tutorial as overloading. Polymorphism is a larger concept which consists of all these different types. So it is not right to say that overloading or overriding alone is polymorphism. It is more than that. Implicit type conversion is called coercion polymorphism. Assume that we have a function with argument int. If we call that function by passing a float value and if the the run-time is able to convert the type and use it accordingly then it is coercion polymorphism. Now with this definition, let us see if Java has coercion polymorphism. The answer is half yes. Java supports widening type conversion and not narrowing conversions. Java does not support narrowing conversion and we will get error as "FToC.java:7: fToC(int) in FToC cannot be applied to (double)"
The above code will work without an error in Java. We are passing an int value ’98’ wherein the expected value type is a float. Java implicitly converts int value to float and it supports widening conversion. Universal polymorphism is the ability to handle types universally. There will be a common template structure available for operations definition irrespective of the types. 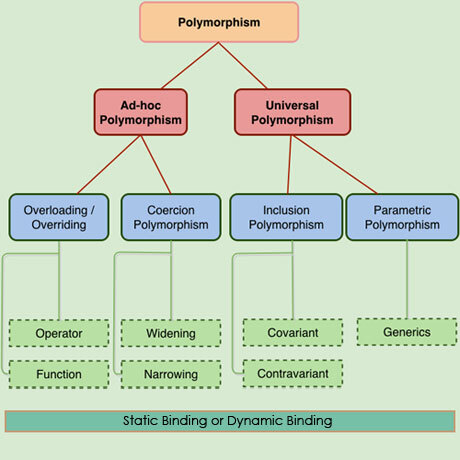 Universal polymorphism is categorized into inclusion polymorphism and parametric polymorphism. Substitutability was introduced by eminent Barbara Liskov and Jeannette Wing. It is also called as Liskov substitution principle. Replacing the supertype’s instance with a subtype’s instance. This is called inclusion polymorphism or subtype polymorphism. This is covariant type and the reverse of it is contravariant. We have discussed the substitution principle and covariant types, contravariant and invariant earlier in the linked tutorial. This is demonstrated with a code example. Java supports subtype polymorphism from Java / JDK version 1.5. Here we go, we have come to ‘Generics’. This is a nice topic and requires a full detailed tutorial with respect to Java. For now, parametric polymorphism is the ability to define functions and types in a generic way so that it works based on the parameter passed at runtime. All this is done without compromising type-safety. The following source code demonstrates a generics feature of Java. It gives the ability to define a class and parameterize the type involved. The behavior of the class is based on the parameter type passed when it is instantiated. Give all the above polymorphism types, we can classify these under different two broad groups static binding and dynamic binding. It is based on when the binding is done with the corresponding values. If the references are resolved at compile time, then it is static binding and if the references are resolved at runtime then it is dynamic binding. Static binding and dynamic binding also called as early binding and late binding. Sometimes they are also referred as static polymorphism and dynamic polymorphism. Let us take overloading and overriding for example to understand static and dynamic binding. In the below code, first call is dynamic binding. Whether to call the obey method of DomesticAnimal or Animal is resolve at runtime and so it is dynamic binding. In the second call, whether the method obey() or obey(String i) should be called is decided at compile time and so this is static binding. Extensibility: Extending an already existing system is made simple. De-clutters the object interface and simplifies the class blueprint. Nice Blog. In a similar fashion are there any types in encapsulation? I am from Computer Science background & Concept wise, I am familiar with the Core Java. But, During interviews I am not able to answer as efficiently as possible. I think like I am required to have some practical knowledge so that it will be easy for me to crack the interview & gain confidence. From where should i start for the core java experience ?? Any suggestions would help. Thanks in advance. P.S: I didnt see any column for posting this question due to which I happened to post here. Very good sir. I like your all totorial. Great Articles, Great Blog!!! I’m going through your blog like a kid in a candy store! From where do you get all these info. Wow I never knew polymorphism has such a wide scope. Really enlightening article. sir i have a confussion about this…. In coding example on parametric polymorphism, you use both lower-case ‘t’ and upper-case ‘T’ as type parameters. Should these be the same? Thanks John for highlighting that, I have updated it now. Nice blog as always. I really found this helpful. one doubt. you are passing string in generic example provided where String should be there..am I correct? I understood how Abstraction concept is used in Inheritance and Encapsulation but how is abstraction concept used in Polymorphism? Can you add search option in your site so that it is easy to search with kewords.. Comments are closed for "Java Polymorphism". Why Object is Super Class in Java?